Nadia is reading for a DPhil at the Environmental Change Institute, University of Oxford. She has two Master's degrees with honours in Social Anthropology and Altaic Studies from the Russian State University for the Humanities (2009) and the University of Helsinki (2013). Within her Master studies, she spent an academic year studying at the Institute of Asian and African Studies, Humboldt University of Berlin. In 2013, she got a kandidatskaya degree (equivalent to a PhD) from the Institute of Ethnology and Anthropology, Russian Academy of Sciences. Before coming to Oxford in 2016, she worked as a research assistant for the Erik Castren Institute of International Law and Human Rights and as a research fellow at Moscow State University. 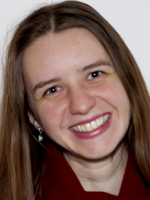 Nadia's main research interests are Indigenous People of Siberia and the Arctic, linguistic anthropology, space and place studies, and ethnophysiography. She carried out twelve expeditions in Siberia and the Russian North. As an anthropologist, she also worked for the Joint Program of the Council of Europe, European Union and the Russian Ministry of Regional Development and Exxon Neftegas Ltd.
Nadia's thesis is devoted to the comparative study of spatial knowledge, language, and adaptation among the Ewenki people of Northeastern and Central Siberia. The uniqueness of the Ewenki lies in the fact that they are one of the few indigenous groups in the Arctic living in such expansive and diverse environmental surroundings as mountainous taiga, tundra, coasts and steppes. The central question of her research is how Ewenki language encodes space and landscape, and what this reveals about people's spatial knowledge, patterns of movement, and adaptation to new environments. For a full list of Nadezhda Mamontova's publications go to academia.edu.